The Elite Stretcher Bar Cross Braces connect between Elite Stretcher Bars and Elite Straight Braces. The stretcher bars and straight braces have a patented groove on the inside of the bar and along the edges of the straight brace that work together to provide a solid housing for the cross brace. Two cross braces are required to form a single cross for frames that are 72" and shorter. No cutting or woodworking is required, however a rubber mallet is needed for assembly. 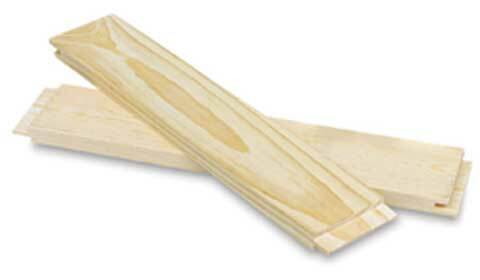 Wood glue is recommended at the center cross for increased support. This stretcher bar and bracing system makes it possible to construct very large, strong, museum quality braced canvas frames that are key-able at the corners as well as on every brace that connects to the stretcher bars.